What’s the best way to spend an afternoon? Why, playing with dogs of course! Yesterday I had the privilege of attending the Grand Opening celebration for The Canine Connection in Fayetteville, Arkansas. I’d donated a copy of my latest release, Deadly Ties (set in a dog kennel, so a perfect match), and was on hand to watch the excitement. If you’re in that part of the world and looking for a place to board, groom, or train your dog, be sure to check them out. I loved the personal attention that both dogs and owners received. And even if, like me, you arrive without a dog you’ll still enjoy VIP treatment and a personal tour of the facilities. Even though it was raining when I arrived, I saw plenty of activity because of the large indoor arenas. The owner, Valerie Murphy, knows just how to make the kennel experience a happy one for everyone involved. Whether your beloved dog is a pedigreed champion or the All-American variety kind of dog, Val and her team will treat you like royalty. In addition to clean and spacious indoor arenas, there’s also a separate grooming area, ample room for boarders, and separate outdoor play areas for small and large dogs. If you’re interested in obedience or agility work, this is the place of you. 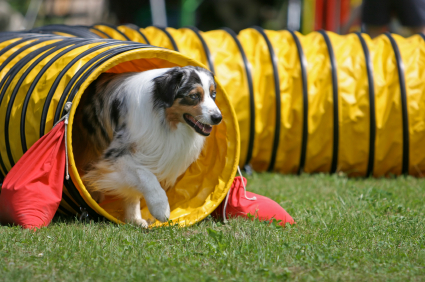 I had the pleasure of watching Jack (a handsome Australian Shepard owned and trained by Diana Nagel) demonstrate a variety of agility exercises. It was very impressive, and I swear he was laughing (or at least barking) with joy as he went around the circuit. My sincere thanks to Valerie and Diana for a lovely afternoon! First, NaNoWriMo (National Novel Writing Month) is in full swing, and so far I’ve exceeded the quota each day! Today’s total (21,116 words) puts me on track to complete 50,000 words of the next novel in the Waterside Kennels Mystery Series. Since the target publication date for Death Tracks is late summer 2014, I better plan to keep up this pace through the spring! The second update: check the “Dogs, Dogs, Dogs!” tab on the website here. You’ll find a cool story about The Ultimate Dog Lady, who happens to be one of my beta readers for the series. You’ll also find some serious information about common household items that can prove deadly for your dog. And coming soon: interviews with a dog expert, a crime writer, and a college professor who wants to use Deadly Ties in an upcoming class. Stay tuned!